Taped Jan. 9 in Philadelphia, Pa.
- This was a well-paced show with a couple of good matches that also moved along several storylines. The finish of the main event set up a personal issue between Tyler Black and Roderick Strong for Black’s upcoming ROH World Title defense against Strong, the American Wolves began teasing a split and a Davey Richards face turn, Kevin Steen and Steve Corino continued to build heel heat by picking on sympathetic jobbers Bobby Dempsey and Alex “Sugerfoot” Payne, and the storyline with managers Shane Hagadorn and Prince Nana both trying to sign “Skullkrusher” Rasche Brown to their stables moved along as well. - The announcers did a great job of making the show opening tag match between the American Wolves and the Dark City Fight Club seem important by talking afterwards about how the Dark City Fight Club’s win gave them a strong case for a tag team title shot, as well as talking about how the loss hurt the Wolves. I am all for continuing to give wins and losses on TV consequences like this. - ROH continued to make the recent 8th Anniversary Show seem important with a highlight package on Black’s title win over Austin Aries. - Mike Hogewood seemed much more upset about Steen and Corino’s post-match beat down of Dempsey and Payne later on in the studio than he did when he was actually calling the action. Hogewood has improved into one of the best wrestling commentators on TV over the past year, but this rare slip up made his commentary seem artificial and forced because of the discontinuity of tone. - The hype for next week’s TV Title tournament should have been better, especially with TNA increasing the competition on Monday nights starting next week. All we got was a quick look at the tournament brackets. Some promos from some of the competitors talking about their upcoming tournament matches, or what winning the TV Title would mean to them, would have been good to give viewers a reason to care about the tournament. The Sara Del Rey promo and squash match could have been put off to another week to make time for this. - The show opened with highlights of Tyler Black winning the ROH World Title from Austin Aries at the 8th Anniversary Show in New York City. Mike Hogewood hyped that tonight’s main event would be the first meeting between Aries and Black since that match in New York. The Wolves took the early advantage by jumping Davis and Chavis before the bell. They dominated for the opening couple of minutes, deploying their signature strike-based offence against Chavis. The crowd was very pro-American Wolves in this matchup of two heel tag teams. 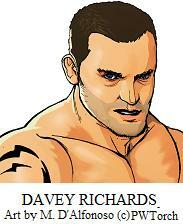 Davis entered the ring illegally at 3:00, while Richards was attempting a springboard elbow. He impressively caught Richards on his shoulders and countered with a spinning slam. This allowed Chavis to tag out, and the Fight Club began working over Richards heel style, deploying a variety of strikes, slams and heel tactics like eye gouges and outside interference. The crowd got enthusiastically behind Richards, cheering for a comeback. Richards mounted a comeback at 5:30 by busting through a double clothesline attempt, hitting Chavis and Davis with a series of leg strikes, landing a snap suplex on Chavis, then tagging out to Edwards. Edwards got a nice run of his signature offensive moves from the hot tag, highlighted by a number of stiff leg strikes and a fisherman buster on Chavis for a near fall. Richards got involved from the apron at 8:00 and the Wolves landed a double enziguiri on Chavis, then Richards took out Davis on the floor with a spinning DDT from the apron. This got a strong babyface reaction from the crowd. Edwards locked his half crab submission in on Chavis at 9:30. Richards tried to keep Davis from breaking it up, but Davis showed impressive power in picking up Richards and ramming him into Edwards to force the break. Davis then shoulder tackled Richards out of the ring, leaving Edwards alone facing a two-on-one situation. Davis and Chavis quickly landed their Project Mayhem finisher for the win. WINNERS: Dark City Fight Club in 10:30. A very good hard-hitting tag match between two heel tag teams. The announcers played up what a devastating loss this was for the Wolves, but what a huge victory it was for the Fight Club to put them in title contention. The crowd reaction suggests the Wolves are ready for a babyface turn, which makes sense since ROH fans love to cheer wrestlers who use the Japanese strong style that both Richards and Edwards use. The Wolves played into the reaction by subtly toning down their usual heel tactics. After the match, the Wolves argued in the ring with Hagadorn seeming to side with Edwards, suggesting that Richards may be on his way to a face turn that will split the team. Corino and Dempsey started out exchanging forearms in the middle of the ring. Corino tried charging at Dempsey off the ropes, but Dempsey countered with a back drop. Corino pulled the referee between himself and Dempsey and used the distraction kick Dempsey in the face. This allowed Corino to take control and work over Dempsey heel style, using heel tactics like hair pulling, raking Dempsey’s eyes on the top rope, and disrespectful slaps. The slaps fired up Dempsey for a babyface comeback, which got a decent reaction from the crowd. Dempsey got a brief flurry of strikes and landed a suplex before Corino countered with a roll-up out of nowhere for the win. WINNER: Corino in 2:00. Okay short match to give Corino another win on TV without overstaying its welcome. - After the match, Dempsey attacked Corino. Hogewood speculated that the attack was to avenge Alex “Sugarfoot” Payne. Steen hit the ring before Dempsey could do much damage to Corino, and Steen and Corino began putting the boots to Dempsey. Payne hit the ring to even the odds, but Steen quickly neutralized him with a low blow. Steen and Corino continued beating down Dempsey and Payne outside the ring. Payne bled and Steen wiped Payne’s blood over his own face like war paint. Steen used his package piledriver finisher on Payne and left him lying in the ring. - In the studio, Hogewood ranted that Steen’s actions had no place in ROH. Dave Prazak changed the subject and threw to a pre-taped Sara Del Rey promo. Oddly, Hogewood seemed much more upset in this studio segment than he was when he was calling the beat down seconds earlier. - Clips from a sit-down interview with Sara Del Rey aired, interspersed with action clips from her matches. She said all the women trying to get into the business are trying to be models, while she is trying to be an athlete and a fighter. She said she wants to be a tough fighter, not pretty, and wants female wrestling to be respected. Shane Hagadorn and Prince Nana both came out into the aisle with papers in their hands. Both members of The Set attacked Brown at the opening bell. They tossed him over the top rope and turned their backs to gloat to the crowd, but Brown caught the top rope and skinned the cat back into the ring. Brown took both opponents out with a double clothesline, then followed up with a spinning powerslam on Sin. Lewd went to the top and tried for a cross body, but Brown caught him and countered with a military press. After some additional offense on Sin, Brown used his torture rack-burning hammer finishing combination on Lewd and dropped him on Sin, then pinned both men. WINNER: Brown in 1:30. Mercifully short. - As Brown walked back up the aisle after the match, Hagadorn and Nana tried to get him to sign their contracts, but Brown walked by both managers without stopping. - Hogewood hyped the upcoming main event tag match, and also plugged that the brackets for the ROH TV Title match would be revealed later in the show. Prazak pointed out that Perez is currently one half of the Shimmer tag team champions. Perez got a couple of technical moves on Del Rey in the early going, an arm drag and a roll-up, but Del Rey stopped her momentum with a big boot to the face. Del Rey then worked over Perez heel style for a while, deploying hard kicks as well as heel moves like hair pulls and chokes. Perez made a comeback at 2:00 by dodging a capo kick kick from Del Rey in the corner. She landed a swinging DDT for a near fall and some other strikes, but Del Rey regained control by catching Perez in midair while she was attempting a wheel kick and countering with a fisherman suplex into a bridge for a near fall. Del Rey followed up with a capo kick-piledriver combination for the win. WINNER: Del Rey in 3:30. Decent squash win. It made Del Rey look dominant, but it hurts the Shimmer tag titles to have a co-holder of the championship get so thoroughly beaten by Del Rey on TV. 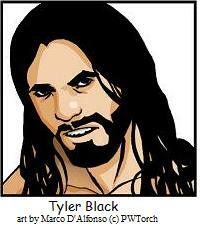 - More highlights aired of Tyler Black’s ROH World Title win over Austin Aries at the 8th Anniversary Show. The ring entrances were not shown, since this match was taped before Aries lost the title to Black. King started the match for his team. The story in the early going was Aries hiding behind King and refusing to tag into the match. Black and Strong tagged in-and-out early on and dominated King with an array of chain wrestling moves, arms drags and strikes. King repeatedly bailed out to ringside to recover and talk strategy with Aries. Aries finally tagged in at 4:30 when King managed to get Strong in a hammerlock. This allowed Aries to tag in, go to the top and drop a double axehandle on Strong while King still had control of Strong’s arm. Aries continued working over Strong until Strong managed to reverse an Irish Whip and land a chop to Aries’ chest, prompting Aries to scurry back to his corner and tag back out to King. The kids in the crowd seemed to be having fun taunting Aries at this point. King and Aries regained the advantage in the match at 6:30 when King backed Strong into Aries’ corner and Aries landed a cheap shot to the back of Strong’s head. This allowed King and Aries to begin working over Strong heel style. King continued to do most of the work and got to display some nice offensive moves, while Aries relied more on heel tactics like chokes, back rakes and distracting the referee while King interfered from outside. Strong sold well and the heels did a nice job of building heat for the hot tag, which finally came at 11:30. Black came in to a good crowd reaction and beat down both heels for a short while. He landed a double DDT on both King and Aries, then followed up with Brock Lesnar’s old F5 finisher for a near fall on King at 12:00. Strong tagged back in and Black executed a flip dive over the top rope to take out Aries on the floor. Strong got a nice flurry of offence on King. Black re-entered the ring and tried for a superkick on King, but King dodged and Black hit Strong instead. Aries grabbed Black’s ankle to prevent him from breaking up the pin as King pinned Strong as a result of Black’s superkick. WINNERS: Aries and King in 13:30. Good character-driven match. Not a workrate classic, but entertaining and very good for what it was. Black tried to apologize to Strong after the match, but Strong was upset and shoved Black. A shoving match broke out, but was quickly broken up by a gaggle of referees as the show ended. We welcome your 0-10 score and comments on this show for an "ROH TV Reax" feature in the Torch Feedback section of PWTorch.com. To contribute your thoughts on ROH, email to pwtorch@gmail.com using our feedback form.